Lead time refers to the period between the start of a process and the completion of a process. An example of lead time is the period between an order placement and its fulfillment. Another example of lead time is how long it takes for a manufacturer to create the finished product once all the needed raw materials are available. It is important for businesses to know the lead time of their processes. Knowing the lead time offers an indication of how efficient the business is. Comparing the lead time to how productive the business is given that time period shows whether the business can streamline its processes further. Lead time can also be an indicator of how flexible a business is. Businesses with shorter lead times tend to be more flexible than businesses with longer lead times. This is because businesses with a shorter lead time are able to introduce changes faster. In other words, sudden changes in the market or unexpected shortages in the supply chain can be resolved quicker with shorter lead times. There are two main aspects of business where lead time is most important. The first aspect is customer satisfaction. Consumers and clients will want to receive their orders as soon as possible. This is especially apparent in e-commerce where online sellers are scrambling to deliver orders within days or even on the same day. Quick order completion has a big influence on customer satisfaction. A shorter lead time also means that the supplier is able to deliver a replacement, in case the first order did not meet expectations. Quick response to customer complaints also increases customer satisfaction. The second aspect where lead time is important is inventory. Especially for businesses that operate following the lean method, having tight control and fast turnover in inventory is valuable. This is only possible if there is a short lead time in replenishing stock. An accurate lead time estimate will help a business in preventing a stock-out but also slow turnover. A stock-out is when the required inventory is unavailable, or put simply when the business is out of stock. The opposite happens with a slow turnover. During a slow turnover the business has too much inventory that is not being used or sold. A slow moving inventory is an indication of waste and being unproductive, both of which is what the lean method aims to avoid. Purchasing lead time refers to the time period between the placement of an order and the delivery of the purchase. Purchasing lead time is similar to customer lead time. Procurement lead time refers to the time from when a business identifies a supply need and when the supplies actually arrive. It is common for certain businesses that the procurement lead time is longer than the purchasing lead time. This occurs when deciding between the product/service type and vendor is a lengthy process. One such example is when a government places a tender for private company. There is a long process whereby the government analyzes the offers put forward and vets the company. Manufacturing lead time is the time period between the availability of raw materials and the completion of the product. Depending on the product this can be measured in minutes, hours, days, weeks or months. 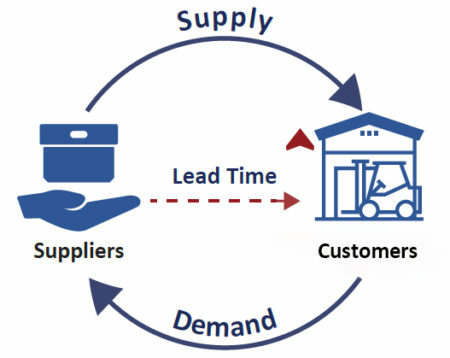 Supplier lead time refers to the time period when a manufacturer or re-seller has to wait for a supplier to deliver an order. Supplier lead time is very important for manufacturers and re-sellers because this influences their total lead time including the purchasing lead time and customer lead time. Customer lead time starts when a customer has placed an order and ends when the customer has received the product or when the service has been completed. This includes the time it takes for the order to be processed, work to begin on the order, the manufacturing period (if applicable) and how long it takes to be delivered. Customer lead time is commonly referred to in e-commerce. In that case, the customer lead time starts when the customer has confirmed and paid for an online order and ends when the customer receives the product. Lead time and cycle time are related to each other but these terms refer to separate processes. The distinction is especially important for manufacturing companies. More specifically, cycle time is a process within a larger lead time process. Cycle time refers to the time it takes to begin actual work on an order and when the order is ready to be delivered. The cycle time does not include the time period between order placement and the start of work on the order. Cycle time also doesn’t include the time it takes for the order to be delivered to the person or business that placed the order. By separating the lead time from the cycle time, a business is able to identify where there is a time lag and where the process can be sped up. 1. Bailey has placed an online order for a mug. The order confirmation shows an expected delivery time of 8 days. If the manufacturing lead time of this order is only 1 day, why is the expected delivery time 8 days? A. Expected delivery time is not a lead time so it has no correlation with the manufacturing lead time. B. The expected delivery time is the customer lead time. This includes the manufacturing lead time but also the order processing time and the time it takes for the mug to reach her address. C. The expected deliver time is the customer lead time. The 8 days delivery time is a safety measure in case the order is out of stock. 2. Which of the following will not affect the manufacturing lead time? 3. A car dealer named Hamid has received an order for a new 4x4 model. The customer has requested a few custom details including different leather seats. 2 weeks after the order confirmation, the manufacturer contacts Hamid. Hamid is told that production of the car has begun but that the requested leather is stock-out. This means that the manufacturing lead time has increased and the car will be delivered 12 days later than expected. Why has the manufacturing lead time increased? A. There is an added supply lead time for the custom leather option. B. The 12 days refer to the delivery time, not the manufacturing time. C. The manufacturing lead time increased because the order confirmation was wrong.